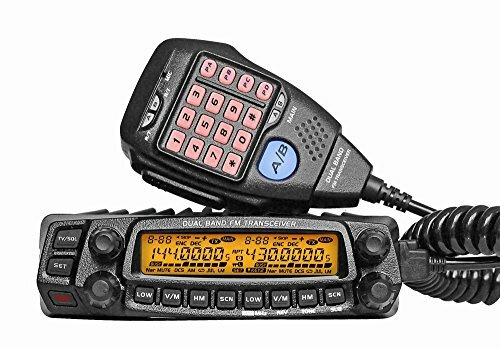 The Anytone AT-5888UV (AT-588UV) DualBand, Twin Receive Dual Display Radio Transceiver for the VHF & 2 meter , & UHF & 70cm bands. Loaded with features, Part 90 Approved, narrow band capability, over 700 AlphaNumeric Memory channels (256 x 4)! Tuning Steps of 2.5, 5, 6.25, 10, 12.5, 15, 20, 25 & 50 kHz. Includes lighted full keypad microphone w/ switchable built-in speaker, use speaker in body, in mic, or an optional external speaker too! Receive Range is: 200-260Mhz, 350--490 MHz, 108-180 MHz (AM or FM Mode on VHF recv, FM mode on transmit). Tuning Steps: 2.5, 5, 6.25, 10, 12.5, 15, 20, 25 & 50 kHz, Backlit, Full Keypad Mic features a built in speaker! Speaker in Radio too! Either side display can be set VHF or UHF - VU, UV, UU, VV ! ctcss, dcs (PL & DPL), ANI, DTMF, Backlit 3 color w/Cool-Blue Display & buttons! Backlit DTMF Mic, Part 90 FCC Certified. 50W on VHF, 40W on UHF with lower power settings down to 5W available. Great for Amateur, Public Service and Commercial uses! PC Programmable w/downloadable free software, Even has a Built-in USB port to charge your phone! Requires 12-14Vdc power hookup, at 12A or more, and an Optional suitable Dualband Antenna. Optional QDM-01 Base Station Microphone, & QMB-03 Front Panel Bracket kit are Available ( sold seperate). Very Compact size, approx 5.5" x 1.58" x 8.35! * 50W/40W Full DualBand VHF/UHF Mobile Radio Transceiver! * Full Twin Display and Receive, Cross Band Repeater mode too! * Features CTCSS, DCS, ANI, DTMF, 2-Tone/5-Tone, Alphanumeric Display, 758 channels & more! * Narrow Band compliant, Remote Mountable Faceplate, Lighted Keypad mic, Built-in Speakers in both Radio & Mic, Built-In cooling Fan, & More!! If you have any questions about this product by AnyTone, contact us by completing and submitting the form below. If you are looking for a specif part number, please include it with your message.